This tutorial will share a step-by-step process to help you convert any (protected) 2D DVD discs to 3D SBS MKV videos, so that you can enjoy them on 3D TVs, VR headsets with better 3D effect. With the growing numbers of 3D devices such as 3D TVs, VR headsets, more and more users have needs to convert a traditional 2D DVD videos to 3D SBS MKV videos to capture vivid 3D scene. To convert 2D DVD to 3D SBS MKV videos for playback, what you need is a profressional yet easy to use 3D DVD converter. Here Brorsoft 2D to 3D DVD Converter for Windows / Mac is highly recommended with below features. Convert any (protected) 2D/3D DVD discs to 3D Side-by-side MKV videos with fast speed and flawless quality. With the built-in editor, you can cut the movie length to only save the necessary part, crop video to remove the DVD movie black edge, add personal watermark to DVD movie, adjust output video effects like brightness, contrast, saturation and hue. The program can help you to convert DVD to H.264, H.265/HEVC, AVI, MP4, WMV, FLV, MPEG, MOV, MKV and ProRes, MPEG-2, DNxHD video and so on easily and quickly. Here both Windows and Mac free-trail-before-purchase are available, don't heasitate to download the free 2D to 3D DVD converter and start to convert 2D DVD to 3D SBS MKV for playback smoothly. Here I take Windows Version Brorsoft DVD Ripper as example, Mac Version share the same steps. Just keep in mind you have download the right version. Windows platform .exe files cannot be installed on macOS – and vice versa. Launch the DVD Ripper, click “Load Disc” button to load your DVD movies to the program. You can also click “IFO/ISO” icon to load your DVD ISO image files. 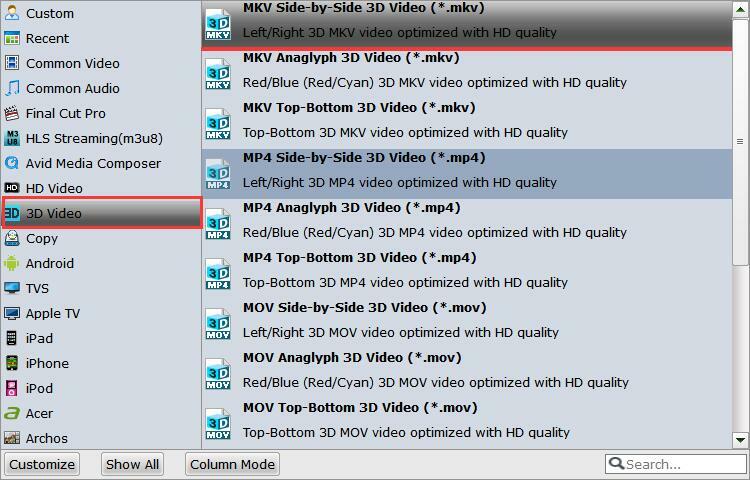 Press "Format" bar and find "3D Video", select "MKV Side-by-Side 3D Video " as your output. Tip: Click "Settings" button to do corresponding settings regarding to video, audio, subtitle, 3D Anaglyph and 3D Depth on your videos. Click the “Convert” button , this 2D to 3D DVD converter will convert 2D DVD to 3D SBS MKV videos immediately. Once the conversion is finished, click "Open" button to get the converted videos and copy them to a USB Drive or Home server. Now you can play the converted 2D DVD movies on any 3D device with better 3D effect. Do it all - Convert, Edit Video and Rip, Backup Blu-ray and DVD movies, 250+ formats, Ultra-Fast encoding speed, ZERO quality loss! And you can also use Video ultimate to convert videos, Blu-ray/DVD or ISO files to 3D SBS MKV videos for playback with ease. How to Play ISO Files on iPhone 7/7Plus (PRODUCT) Red? Blu-ray/DVD to QuickTime MOV: How to Rip Blu-ray/DVD to QuickTime MOV on Mac? How to Play Video_TS files with Amazon Fire TV 2?